Knives are used for everything from carving a roast for a holiday meal to slicing sushi, field-dressing a deer, and fileting a fresh-caught fish. Here at Knives Online, you'll find great deals on knives and blades, including kitchen knives, hunting knives and fishing knives, shop knives, craft blades, and even handy multi-tools from Sog, Gerber and Leatherman. 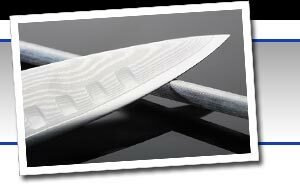 Cooking is one of the most common uses of knives. Nearly every cook has a favorite knife, the "go-to" knife that is always grabbed first for general cutting, slicing or dicing. Many cooks have a complete set of their favorite brand or line of knives, while others prefer to mix and match, perhaps selecting a chef's knife from Wusthof, a slicing knife from Henckels, and a utility knife from Cutco. Our kitchen cutlery section offers a wide array of choices for the cook, from complete knife sets to individual knives in your choice of sizes and styles. SWISS ARMY VICTORINOX 53001 CLASSIC SD RED MULTI FUNCTION POCKET KNIFE. Rough Rider RR176 Wood Handle Drop Point Hunter Fixed Blade Knife 8.25"
Vintage Remington Bullet Folding Knife Plus Free Bonus! SWISS ARMY VICTORINOX 40645 12 INCH GRANTON SLICER FIBROX HANDLE KITCHEN KNIFE.